We talk about it all the time, as VCs, as product managers and as entrepreneurs — but what does it really mean? Ask any entrepreneur or investor about achieving product market fit, and they’ll tell you that once they’d done it, their company started to grow like crazy. They’d built a product or service that resonated with people, and those people were turning into evangelical customers of their business. But it’s not always clear, especially in the very early days, whether this mythical fit has been achieved. Early data can be confusing and the population of customers is small. So, beyond “customers really like us”, what quantifiable metrics are the most meaningful? 1. Customers like the product — a lot. Sean Ellis of Growthhackers.com writes that in his experience, if 40% of existing users of a product would be “very disappointed” without the product, then something special is happening. He concedes it’s a somewhat arbitrary metric, but it’s based on his experience of surveying dozens if not hundreds of startups. 2. Customers are prepared to recommend the product to their friends. It depends on the industry, but as a rule of thumb, if you have a Net Promoter Score over +50, you are doing really, really well. 3. Customers are prepared to spend money. Do customers like this product enough to spend money on it? Especially in the enterprise world, we see a lot of companies who offer their services to business customers for free at first. They work with them to refine the product and add features and get a sense of how they will use the product. This is often a useful step, but it doesn’t ultimately show validation that those customers will pay for the product. Will your customers actually spend money on your product? Obviously, some products are free by design, but if so, are customers engaging with the product and are you clear on the path to profitability? 4. Customers use you over and over again. It’s expensive to acquire new customers, so once you’ve got them, you want them to use your product over and over again. Customer engagement leads to repeat actions (order, message, click etc) that can be measured. These differ depending on the business, but if the engagement is profound and sustained, then you’re onto a good thing. A typical way to analyse customer behaviour is by cohort. A cohort is a defined group type, e.g. customers by age or location. Businesses usually look at customer behaviour according to the time they signed-up for your service. In a business without seasonality, you’d want to see cohort behaviour improve over time, e.g. all the customers who joined in May showing more engagement that users who joined in March. If user engagement is meaningful, and the cohorts are improving over time (individually and by referral), then the magic is happening. I’ve added a really simple — and totally made-up — cohort analysis for a fictional social network below. 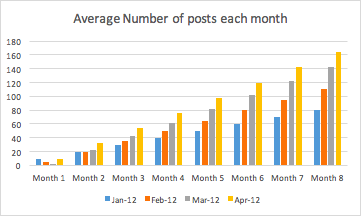 It’s tracking the average number of posts users made each month based on when they joined the network. In this case, users who joined later are posting much more frequently over time that users who joined in earlier — a a good thing. There a thousands of ways to do cohort analysis but it’s only the first step — the next is to understand why. One caveat here is to understand early adopter behaviour. These users tend to embrace new technologies faster than other people and usually show more engaged behaviours (higher basket size, repeat rates, orders, click-through, and more patience with buggy software, etc.) because they love new things. Getting to majority usage may show some drop off in engagement as you transition to “normal” customers, but once you’re in the mass-market, you want to see improvement over time. 5. Customers don’t leave... much. In an ideal (impossible) world, you would acquire new customers every month, and they’d never leave. However, customer churn (the number of customers who leave / total customers) has a huge impact on your business. 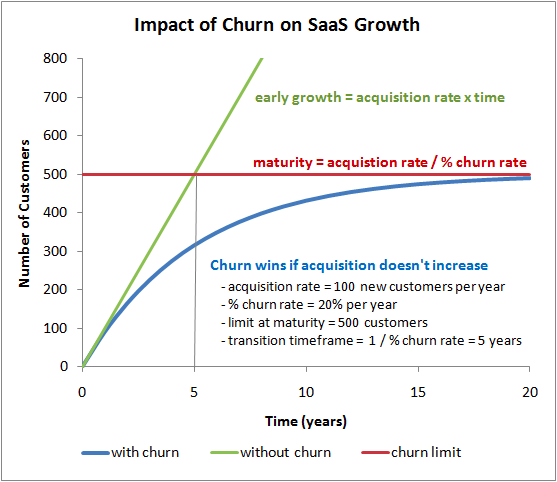 The chart below, from http://chaotic-flow.com/saas-metrics-saas-churn-kills-saas-growth/, shows how your number of customers stabilises once the acquisition rate = the churn rate. In other words, new customers are being added at the same rate as old ones are leaving. Obviously, if you are acquiring new customers at 10% a month, but losing 10% of your old customers, your customer growth will be flat. It’s worse than that though, because acquiring new customers typically costs more money and effort than keeping your existing customers happy, and customers tend to spend more over time. Reducing customer churn by 2% per month in the scenario above would mean an annual increase in customer numbers of 26.8%. A business that is growing exponentially can absorb higher levels of churn and keep growing, but a huge part of growth is staying focused on existing customers as well as going after new ones. “Product/market fit means being in a good market with a product that can satisfy that market.” — Mark Andreessen. Finally, the market part of product-market fit. Pay attention to the market because even a fantastic product in a tiny market ends up being a tiny business. In practice, this means that VCs look for businesses in markets with billions of consumers or that impact billions of enterprise value, so that if you build a great product for customers in that market, your business has the potential to generate outsize returns. That said, product-market fit in a niche, evangelist segment can be key even if wider market adoption isn’t happening — and on the face of it, the slow market-wide adoption could be obscuring the insight that something is working really well in the niche. Look carefully at the cohort data (e.g. you may be doing really well with under 25s in Italy for some reason). Then it’s a case of deciding why that niche is working, what insights you can act on, and if the niche is big enough to build something meaningful. 7. You’ve got the data you need. At the end of the day, all of the data in the world won’t substitute for judgement and experience, but without quantitative metrics to assess whether you’re getting to product-market fit, it can be hard to move beyond fuzzy definitions like “we’re getting really good press” and “things feel like they are going well”. It’s basic human nature to pay attention to things that are being measured, so make sure you’re measuring the right things! VC @localglobevc. Co-founder @turo. Lover of all things London.